After a good night’s sleep we woke to find that it had rained. The Harleys were covered with water. The sky exhibited all the signs of a storm passing through, but the clouds were breaking up. After an in-depth debate (5 seconds) we decided, It’s not gonna rain, but we need warm clothes. In hindsight, the sky looks like rain. We left Grangeville for Missoula at nine. Six miles later I spotted a D.E.E.R. A doe was standing about ten feet off to the left of the roadway. We climbed from the valley floor to this beautiful stop on Idaho 13 midway between Grangeville and Kooskia. We stopped in Kooskia for breakfast. After breakfast we gassed up for $3.91, the cheapest gas we have purchased so far. I think it is because we were on the Nez Perce Reservation. While waiting I used the bathroom. It held a surprise. When I needed a paper product, I found the dispenser empty. I tried calling Jim on my iPhone for help, but there was no service. In desperation, I looked out in the hallway. There was no one in sight. Holding my trousers up, I rushed to the woman’s room. When I returned to the dining room, a man passed me headed to the facility. I told the server the problem and that another man was on his way. She blushed, hurried away and came back with the largest roll of T-P I’ve ever seen. I offered to carry it for her. She thanked me and away I went on my errand of mercy. After breakfast we took a short break. Leaving town, we crossed the Clear Water River and turned off Idaho 13 and on to Idaho 12. Idaho 12 was another great ride. Within a few miles we saw a yellow warning sign. It advised us that we had 99 miles of windy road. It was true, wonderfully true. I was at a loss for a moment until I remembered that I had a Blue Knight License Plate Frame. This picture is indicative of what we experience over the 99 miles of windy road along the Lochsa Wild and Scenic River. It was just another day in paradise. Well almost. Taking a close look at the roadway will show that it is wet. We stopped, unpacked all our stuff, and pulled out the rain gear. I hadn’t worn mine in a couple of years. It seems that someone removed some material, the pants don’t zip up and the buttons don’t reach the button holes. Jim wanted to stop at a comfort station. Idaho places them along the road but do not mark them nor do they have signage telling you one is ahead. You have to guess. Jim guessed a few times before we found one. One of those times, he was coming back onto the roadway when he dropped his Ultra in the traffic lane. There was very little traffic on the highway, except we had just pulled away from several vehicles at a road work stop. It rained until we got to Missoula. At the first stop light, the rain was replaced with warm sunlight. Our first stop was Grizzly Harley-Davidson where we purchased two much-needed shirts. While I was pulling out of the parking lot, I saw two motorcycles parked in the lot. They had passed us earlier in the day, and we had passed them about fifty miles back down Idaho 13. As I went by I noticed the bikes had New York license plates. Then I noticed the green flag. I saw two things, “Hart Comfort Home” and “Wellsville”. I know that the Hart Comfort Home is an outstanding asset to the families of those suffering a terminal illness. My knowledge comes from my wife, Cathy Dean Cramer, and all my Dean in-laws. Cathy was born in the Village of Wellsville. I stopped my bike behind the two motorcycles and went back inside the store. I found two real gents, Jim Smith and Rob Warboys. Both had flags, but Rob’s came apart. 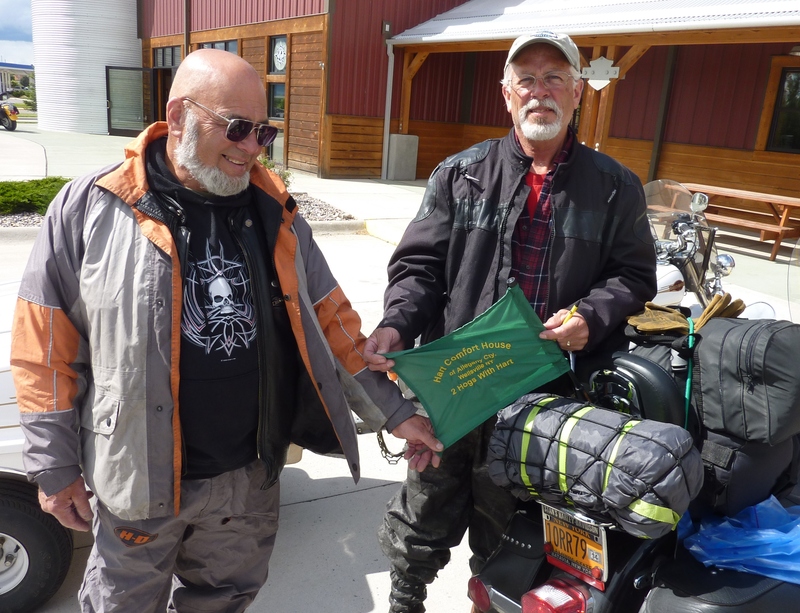 They rode to the west coast and are now on their way to Glacier National Park and then on to US 2 and across the top of the states back to Wellsville. Not only are they riding, they are raising money for the Hart Comfort Home in Wellsville. You can check it out at http://www.comforthouseofalleganycounty.org. Always carry Kleenex in your pocket. You never know when you’ll need it.